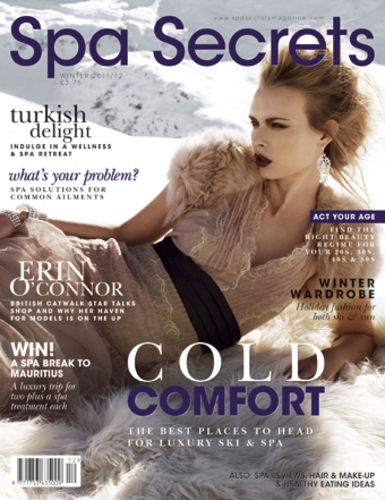 (LONDON, UK) 19 December 2011: The 164-page Winter issue of Spa Secrets is out now and asks when was the last time you considered changing your beauty regime - is there an age-specific beauty regime for you? •	The Big Question: Is there a right time to become a parent and why are so many women leaving it later to start a family? •	Beauty and Wellbeing features include – spa treatments to help you combat common problems from water retention to uneven skin tone; and the latest perfumes and nail polishes for your beauty bag. •	Travel: Ski & Spa – choose from one of the top ski resorts and do your après ski in the spa. Or head for some winter sun in one of the luxurious resorts in South East Asia. •	Competition: A five-night holiday for two, in Mauritius with Four Seasons Hotels and Air Mauritius. •	Superb Subscription offer: Subscribe for only £5 and receive a free Elemental Herbology product worth £40 (while stocks last). •	Trends: Tackling the latest fads from fashion, to beauty and nutrition. •	The scene: What are the latest beauty, spa and salon innovations? We round up this season’s best new products and update you on the latest news. •	Fitness & Health: From personal fitness trainers, to Bikram yoga, foods to boost your immune system and fend off the common cold and why honey is so good for you. •	Spa Secrets Magazine is a quarterly, lifestyle title published by Absolute Publishing Ltd and currently available in Selfridges, Harrods, Tesco, 100 London Marks & Spencer stores, and health and fitness centres — and is distributed, free of charge, to a controlled circulation. •	T: +44 20 7253 9906. •	Absolute Publishing Ltd is a London-based publisher, with more than 10 years’ experience in travel, sports, consumer, business-to-business, customer and direct response publishing. This press release was distributed by ResponseSource Press Release Wire on behalf of APL Media (Absolute Publishing) in the following categories: Health, Women's Interest & Beauty, Travel, Media & Marketing, Retail & Fashion, for more information visit https://pressreleasewire.responsesource.com/about.